8”x6” Oil on canvas panel. $150. this month at the Artist Guild. and not an exact copy. at her task and the chest behind. a lot of my version. Of course I enjoy the painting but love, being drawn into the background. I continue finding little surprises throughout this painting. Great job Julie. That is a lovely comment, Blanche. Thank you. Big smile on my end. Hope you are still painting up a storm. This is wonderful Julie. Have to say I love your painting. While I revere Norman Rockwell of course, actually am drawn to your version more than his. Totally serene and lovely Julie! The softness, lighting and pose of the figure are absolutely perfect. I am very happy you feel it is serene, Lauren. My mother would sit and knit in the evening before my bedtime and the peaceful atmosphere calmed me and my sisters down. I have always associated knitting with a certain calmness ever since. Congratulation on selling your painting. Wish i could have got to the show. This is a special one Julie. I am not surprised it has sold already. So serene. Julie - this is beautiful. No they are certainly not alike but what a wonderful way to show how each of artist paints completely different. Yours is far prettier in my estimation. Hugs! This painting is very peaceful to me. Very reminiscent of the paintings a while back where the woman would be doing daily chores, having tea, reading or holding a child, etc. Mary Cassatt? Frank H. Desch? Vermeer? I love these types of scenes, and they have a nostalgia and empathy there as I think of moms, aunts, grandmothers and others not known who quietly manage to actually sit down and be busy with an task during their day. The color of your woman's dress is perfect for that scene. She looks very content! 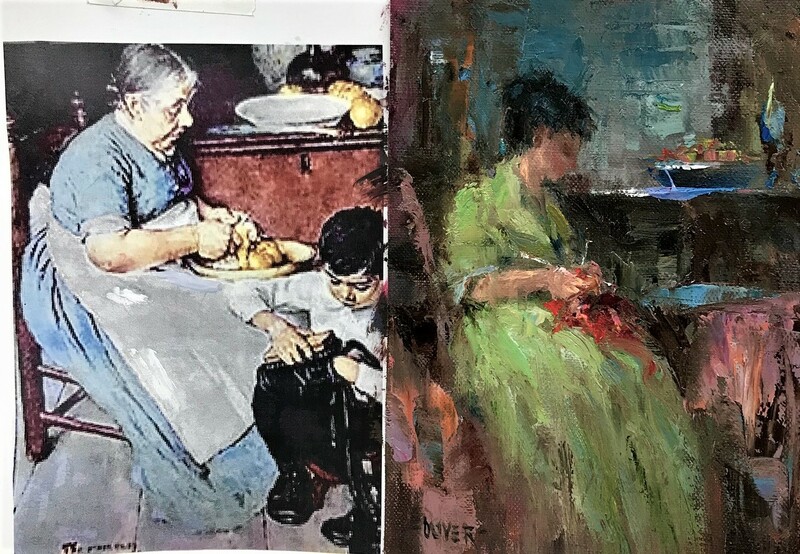 No, never would have guessed, two totally different feelings , and without taking anything away from Norman Rockwell...yours is totally awesome ! Lovely, Julie. It has an intimacy that you've captured perfectly. 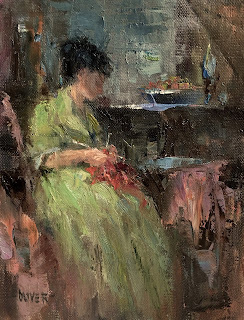 I especially like the colors you selected -- the green of the dress and the salmon tones adjacent to the figure -- they work so well together, but I doubt I'd have thought of using them! You are such an accomplished colorist. Also, even though the style is different, your painting brought to mind some of the works of artist Pino Daeni. Are you familiar with his sublime figurative paintings of women? They often portray that air of quiet self-possession your figure has. This is really special and seems to be filled with feeling. Maybe that is because it reminded you of your mother knitting. Wonderful painting!! I LOVE your painting Julie!! It takes me back when my Mom would be crocheting in the “parlor”... I always sat with her as she made a ball with the yarn. Thank you for taking me back!! Her dress is amazing..love the color and when I zoomed you see that amazing texture..... another winner!!!! Love your woman knitting painting, Julie. I am a knitter, but not a good one. Such good advice about taking inspiration from a valued source! Wow, Julie! Your interpretation is so warm, so inviting - I could look at this painting for an hour and never see enough. The turn of her head, the glow on the wall behind her - just masterful! This tells a story to most of the viewers Julie! It is incredible! So beautiful, creative and lovely figure painting !!! I love this idea, Julie. I will give it a try!